With Christmas approaching, Dolores Sand has put me to work making her collection of Christmas Carols available here at the Cree Literacy Network. I’ll be adding them a few at a time to the “pages” menu of the website, under the heading “Christmas in Cree“. I’m also trying to collect an appropriate image to accompany each one. 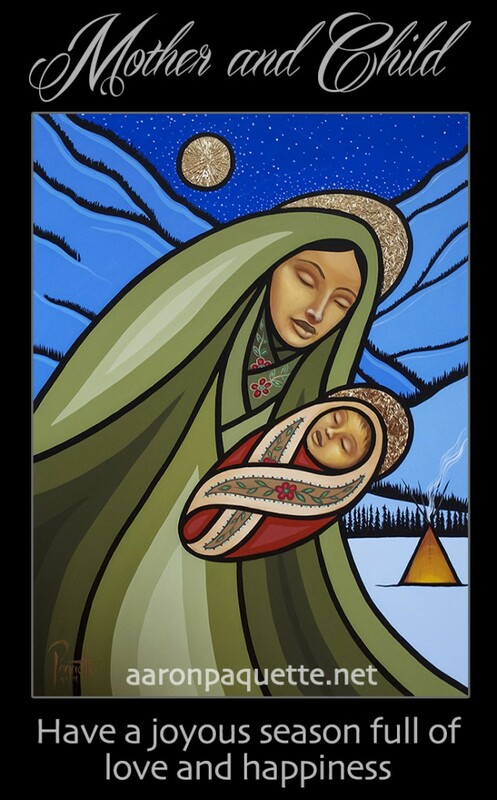 This morning’s addition is Silent Night, accompanied by Aaron Paquette’s beautiful “Mother and Child“. Thanks to Dolores Sand and Aaron Paquette for these early Christmas Presents — to be stored here online for Christmases Yet to Come. With thanks to Aaron Paquette for his generous permission. This entry was posted in Christmas, Dolores Sand, Songs in Cree and tagged Aaron Paquette. Bookmark the permalink.